Does not have a pump. The required flow through the chiller is between 240 gph and 960 gph.10 degree cooling up to 80 gallons. 30 degree cooling up to 30 gallons. Note: These temperature pull-down ratings are in ideal situations. 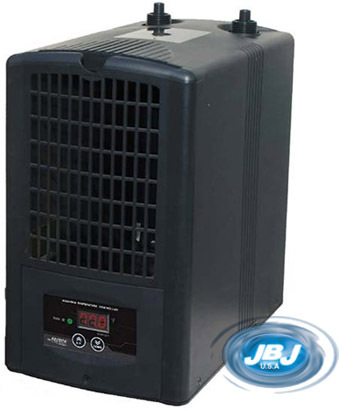 We highly recommend purchasing a chiller one size larger than the specifications would lead you to believe is necessary. 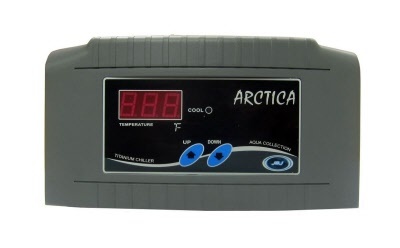 Integrated Thermostat – Simple keypad programmable display with constant temperature readout accurate to +/- 1 F. The controller can be set as low as 32F 9.8" x 16.5" x 18.5"
Chillers should not be placed in an enclosed area without adequate air flow. Feel free to email us for a copy of any warranty policy. Free ground shipping! Lowest noise; vibration. Full digital temperature control system. No hard plumbing necessary. Condenser grill located in front for regular maintenance. New-reverse airflow technology. Small footprint. Energy efficient 200 watts. "easy lift" side handles. CE approved. 2 year warranty. 3000 BTU/hr; 3.6 amps; flow rate minimum 480 GPH; dimensions (W X D X H) 10" X 16.8" X 18.2"; weight 49 LBS; inlet/outlet 1/2", 5/8" 3/4".